True, this nested lab will not impress you with a high performance, but it works. Mainly this example will help you to understand the necessary steps to install your own homelab without investing a lot of money in hardware. And you do not need a physical shared storage, as we use an openfiler to provide an NFS Share using the local hard discs. Of course you can use any other available hardware. I used the old HP DL380 G5 just as an example. The only thing you should take care is, that the hardware is supported for vSphere 5.x (take a look at the HCLs for this). – One HP DL380 G5 Server with as much RAM as you can find (minimum is 16 GB, better have more) and enough discs to provide two arrays with about 400 GB each. First we will install ESXi 5.1 on our HP DL380 G5 Hardware. 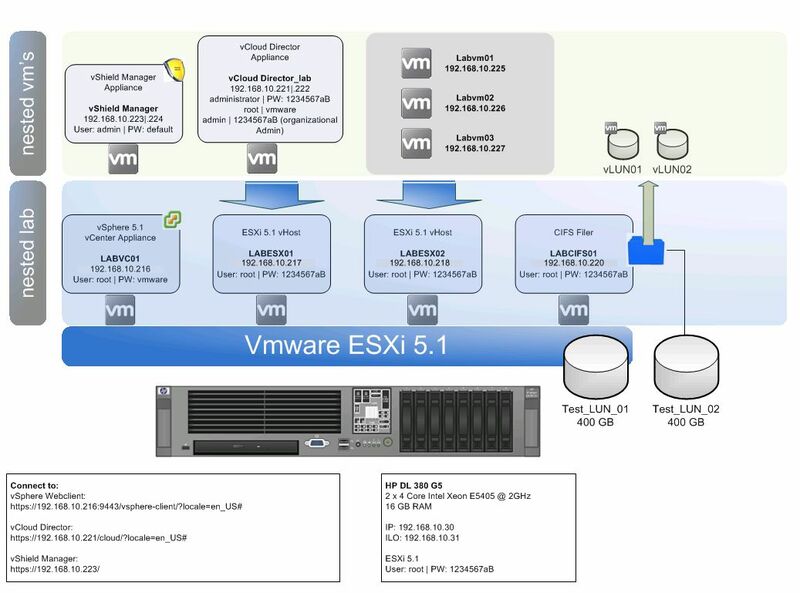 Then we install four virtual machines for our Lab: two nested ESXi Hosts, a vSphere 5.1 vCenter Appliance and an Openfiler to provide NFS shares as a shared storage for the nested ESXi hosts. Last but not least we will install some virtual machines on top of the nested ESXi hosts. I will not provide you a real step by step manual where you can see a screenshot of every window coming up during installation. You should already have some experience in installing and configuring vSphere 4.x or 5.x. vielen Dank für dieses gute Tutorial! Wie hast du es aber geschafft 64bit Maschinen neasted auf dem DL380 G5 zu installieren? Welche BIOS Version hast du installiert? Meine ist aktuell auf: 2011.05.02 (A) (20 Jul 2011). Very Very good tutorial , everything was so good and clear , but l did not understand one thing , what is nested ? “nested”: one embedded inside of the other. Esxi is normally installed on a physical PC or server. For “nested” case, an Esxi is installed in a Virtual machine not physical one. I was able to get the following equipment from my work place to use for my lab. Now the question is that how much can I really practise while running things on a monster lab server with the following specs as shown below. Or should I invest in building a physical 4 host server lab rather than going for the nested route. The keys things I’m testing and preparing for are for vcix dc and nv tracks. Awesome article. Thanks a million for this valuable info.